With a movement within the Arts and Science Federation of Associations calling for accreditation for individual members, the cover asked if ASFA, as it currently exists, could die? Its a fair question to ask. Despite its name, ASFA now exists as a student association and not a federation. What this means is that ASFA’s current structure treats the member associations (groups without accreditation or any legal power outside of ASFA) as committees. The main interview subject, Bruno Joyal, said it himself. With the reform that Joyal is proposing, ASFA would be flipped on its head and would go from being a small student union-type structure into a body of deliberation and coordination across the 27 MAs. This would be the end of ASFA as we know it. Without any warning or consultation with The Link, and without any complaints or concerns voiced from anyone at ASFA, including President Aaron Green, Joyal used The Link’s website as a platform to call the article a piece of “sensationalist journalism,” he mentioned that the piece was “distorted,” and a part of the newspaper’s “radical political agenda.” Joyal also libelously stated that the article had a “quite large” number of factual errors—there was one error, where the word “accreditation” was used instead of the word “incorporation.” The error was fixed in the web edition. Joyal also tried to distance himself from the cover idea, in case anyone thought he had any editorial sway at the newspaper. I can tell you that Joyal, who approached The Link with the article in an email (attached below) and thanked The Link after the article was published (also attached below), had nothing to do with The Link’s editorial policy last week or any other week before it. In fact, the use of the word Independent on The Link’s cover means that no politician at Concordia, including a politician like Joyal, has any say whatsoever on the content of The Link. Joyal seems to have a very skewed view of journalism, where journalists are stenographers of his “constructive ideas” or can do no contacting of other organizations or analysis. Journalists are neither of the three: they are not stenographers, they are capable of using a method of external communication and they are capable of analysis. I would also add that the 14 members of The Link’s masthead are quite capable of making decisions for themselves, as they have for the past 18 issues of this volume, and as they will do for the last 12. If Joyal or Green have any comments or questions for The Link they can contact the newspaper. We also have a very forgiving letters policy. However we won’t print libel, online or off. I’d like to point out that I, or any other executive of any other association, have absolutely nothing to do with the “death of ASFA” idea. It’s nothing but sensationalist journalism, as Aaron says. The interview I gave was balanced and I was only concerned with sharing constructive ideas. 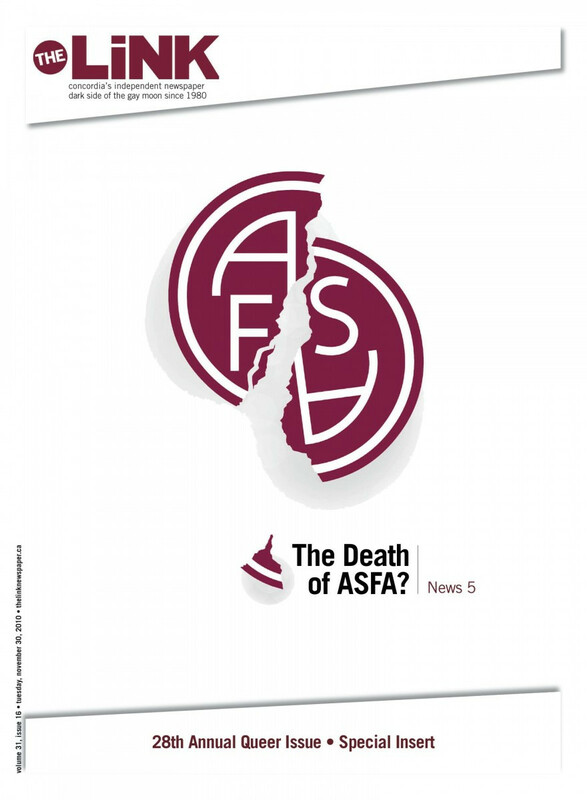 I am surprised that the emphasis was put on an idea (the “death” of ASFA) which nobody but the journalist had in mind and which certainly never came up in the interview I gave. I spoke about reforms and not about “death”, whatever that word could mean (dissolution? give me a break!). Also, the number of factual errors in the article is quite large. For example, the article begins by stating that we requested accreditation; we didn’t, since we haven’t even had a poll yet. I was clear about this. I am also sorry that other associations were mentioned in an article they essentially had nothing to do with. The Link has its own radical political agenda which the current situation was distorted to fit. However, I stand by whatever I said which is explicitly quoted in the article. sender-time	Sent at 3:46 PM (GMT-05:00). Current time there: 6:42 PM. thank you very much for the article. It is appreciated! We are not as radical as the cover makes it seem, and we haven’t filed for accreditation yet (only for incorporation). However, I think the article is good and it will force students to think. thanks a million, I will keep you informed. sender-time	Sent at 8:15 PM (GMT-05:00). Current time there: 6:40 PM. First, I would like to thank you and to congratulate you for the recent series of articles concerning the “student centre” project. I believe your paper did an excellent job at exposing the numerous issues behind the fee levy increase. It’s my opinion that, ultimately, the articles will have played a decisive role – many students mentioned them to me, which is quite unusual. I would like to invite you to turn your attention to the current situation of the departmental student associations at Concordia. (What I have to say is mostly about the student associations of the Faculty of Arts & Science, i.e. those which fall under ASFA, but from what I know, it applies to other faculties as well to various extents.) For the moment, most, if not all, of the student associations have no legal status whatsoever. They are merely “member associations” of their respective umbrella association, as described in the umbrella’s By-Laws. In many universities in Quebec, such as UQAM and Université de Montréal, each student association is a non-profit organization, run like a company whose students are the shareholders. This has the effect of rendering the association essentially independent from its umbrella association, and much more liable towards its members, the students. A student association which is a non-profit organization can also seek the government’s accreditation. Accreditation is a process by which the Government, following a successful polling of the student body, recognizes the legitimacy of the association. This has the effect of allowing the student association to establish an assessment (i.e. a fee levy), which is to be paid by the students to their organization. At Concordia, however, only the larger associations, like ASFA, are accredited. This means that, for the moment, only these large associations can be directly funded by the students. Smaller associations, such as department-specific associations, are encouraged to seek membership into the larger ones, so as to obtain funding. The resulting situation is that all of the fees paid by students to their associations are received at the top of the chain, by CSU and by the Faculty associations. These “federations” (which are not federations in the sense of the Act respecting the accreditation and financing of students’ associations), are then, in theory, supposed to take these funds and split them up, somewhat arbitrarily, between their “member associations” (of course not before taking a large share, such as 50%). The result is that small associations, which are the closest to the student body and which are, in effect, the only associations responsible for maintaining student life (inasmuch as frosh is not part of student life), become completely dependent financially upon the larger associations to function properly. The large associations are very much aware of this situation, but they profit from it financially, so they do not loosen their grip easily. For example, one of ASFA’s By-Laws states that its member associations may not levy their own fee! This is completely against the purpose of the Accreditation Act, if not outright illegal. This means that departmental associations, which are run for free by elected volunteers, often end up wasting their energy by fighting for funds rather than using it constructively to enrich student life. For the moment, it is the Financial Comittee of ASFA, composed of six people, which decides, at its descretion (this is written, word for word, in the By-Laws), of the allocation of 18 000 students’ money. My association (MASSA, the Math & Stat student association) has decided that this situation is outright ridiculous, and that it should change quickly. We informed ourselves about the accreditation process, and we have decided to go through with it – to our knowledge, this is an unprecedented event at Concordia. This week, our intentions spread by word of mouth, and now many other associations have decided to seek accreditation (I can’t say how many yet, but there has been one more every day for the past few days). We believe that a true revolution has begun, and that the way student associations are run and funded at Concordia is about to change dramatically. I would be glad to know what you guys think about this, and perhaps provide you with some further information should you like to write about it. Perhaps Mr. Ethan Cox, who is probably aware of the situation already to some extent, might be particularly interested. Thank you for your great work, keep it up!